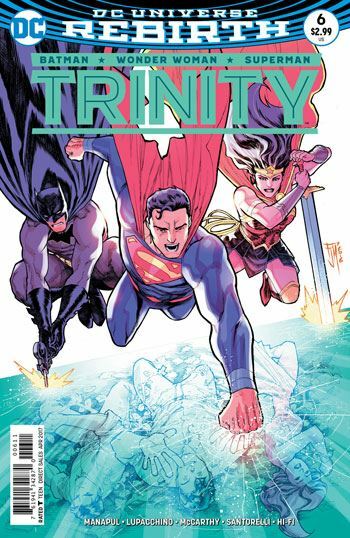 Francis Manapul brings the first storyline to a conclusion in Trinity 6, and it’s a very fulfilling one. Not entirely a happy one, but fulfilling. 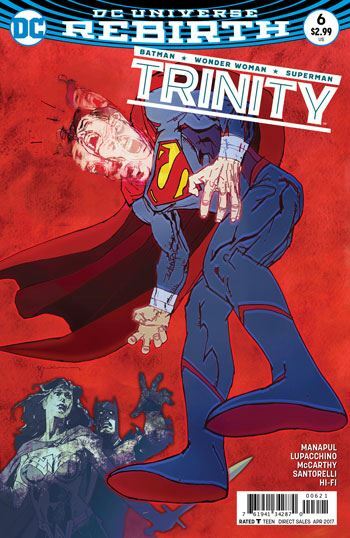 Superman, Batman and Wonder Woman are trapped in the Black Mercy’s realm, while Mongul takes advantage of their situation to inhabit Clark Kent’s body, in order to escape it, with Poison Ivy as his unwitting accomplice. It took a while for all this to become clear, but the story played fair throughout, and the unfolding of the reality of the situation was well told and nicely paced. And while we get the action and drama required, Manapul also makes sure to delve into what makes the heroes unique, and how each one has triumphed over their particular challenges in different ways, according to the strengths of their personalities. Lois Lane and Jon Kent continue to play significant parts in this story, which sees Jon having to battle his powerful father. It’s really his good fortune that Mongul is not used to Superman’s power set, or his weaknesses. Where the story denies a happy ending is in the Poison Ivy thread. I really like the way she has been used in this overall story arc, though she did take quite a while to put together the connection between the heroes she has dealt with before, and the three supposed civilians she is dealing with in this tale. But the penny does finally drop for her. Poison Ivy’s maternal feelings for the White Mercy have made the character far more vulnerable than we are used to seeing. It never takes that much to make Poison Ivy a sympathetic character, and Manapul brings the reader to that point gracefully. All in all, these first six issues show a writer and artists at the peak of their game, with a lot of intelligence and subtlety to the storytelling.